Sharing an email address with a spouse/child. Sing/play in the same group. Need to respond to events independently. An account is uniquely defined by email address and first name so you can have multiple people sharing the same email address. When an administrator creates a new event, Muzodo will send you two notifications, one for each family member. Each family member responds independently by clicking on the response in their respective email. Other than that it works just like separate email addresses. 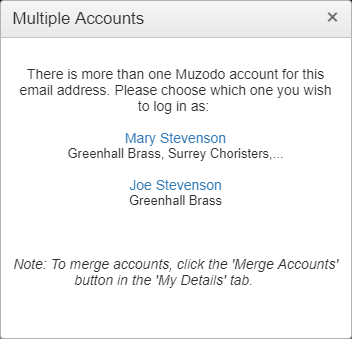 When you log in on either the web or the mobile app, Muzodo will ask you for which account. NOTE: You'll be presented with an option to merge accounts. This is a case where you do not want to merge. Once logged in, you'll notice your name in the top left corner is clickable. Click this to switch accounts.